The fall of 1957 was a low point not only for the United States, but for another high-minded world power: IBM. As the US looked up at Sputnik, without a satellite of its own, IBM was haunted by a rival machine known as the Gamma 3. Built by an upstart French outfit, the Gamma had trumped Blue Blue's fledgling computer tech - not to mention its European sales - and the company lacked even the blueprint for a response. In the fall of 1957, the International Business Machines Corporation had no major business machine in development. 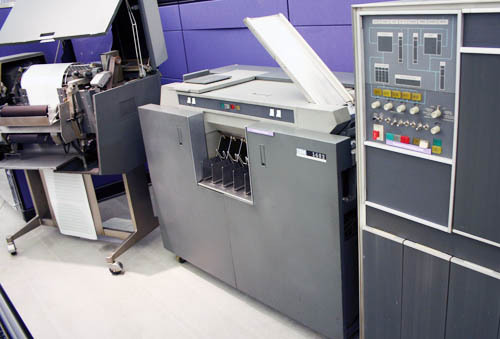 But just as the US would reclaim lost ground with the Mercury space program, IBM would battle back with the 1401, a seminal stored-program machine fated to become the most popular computer of the 1960s. This year marks the machine's 50th anniversary, and last week, at Silicon Valley's Computer History Museum, three of the system's founding fathers gathered for a night of nostalgia. Introducing the venerable trio - chief architect Francis Underwood, project head Charles Branscomb and planning manager Sheldon Jacobs - current Big Blue marketing boss John Iwata called them "IBM's version of the Mercury astronauts". Shipped in 1953 by a French outfit known as Compagnie des Machines Bull, the Gamma 3 was an early electronic computer that served as both accounting machine and general purpose calculator. Big Blue had dominated the accounting machine market for decades, but according to Charles Branscomb - an exec in IBM's Endicott, New York lab at the time - its technology had suddenly fallen behind. "It was a wake-up call. The Gamma 3 was a calculator that actually attached to an accounting machine, and the IBM Europe people were very concerned," Branscomb says. "They came to the corporation and alerted the corporation that there was a competitive threat - and that something had to be done about it." Big Blue's initial response was to fashion a transistor-based system known as the Worldwide Accounting Machine, WWAM for short. Its processor was designed at IBM's French lab in Paris, its punchcard reader and printer at a German lab outside Stuttgart. In 1957, Branscomb was appointed area manager for accounting machines at the Endicott lab, and his first task was to review the WWAM's progress. That October, he flew to France for a meeting with the product manager overseeing the processor design. And as Branscomb sat down, the Frenchman couldn't help but mention the satellite the Soviets had launched the day before. "The Russians put up Sputnik yesterday, and it goes around the world saying 'Beep, beep, beep,'" the Frenchman said. "Then, when it gets to the US, it says 'Ha, ha, ha.'" The irony is that the IBM - including the Frenchman himself - was in much the same position as the Sputniked Americans. After Paris, Branscomb flew to Germany, and he soon told the corporation that the WWAM project should be terminated. Like so many accounting machines that came before it, the WWAM was programmed through plugboard. "[The European labs] had done some creative work. They had tried to make the best use of a control panel, but it was still a control panel machine and technology was on the move and my conclusion was that it was not going to get the job done," Branscomb remembers. "Here it was, late third, early fourth quarter 1957, and IBM's largest revenue base had no machine in development."